The cult ice cream Salt & Straw comes to Seattle, while Bellevue gets a new food hall with burgers and ramen. Finally, the wait is over, though you will have to wait in long lines. 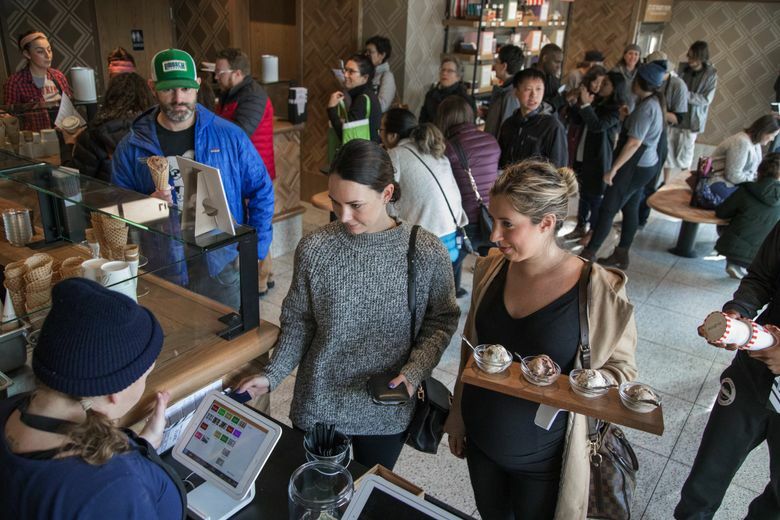 Salt & Straw ice cream opened in Ballard last week and is scheduled to open on Feb. 16 on Capitol Hill, near the corner of East Pike Street and Boylston Avenue. The stores feature 16 flavors, from strawberry-honey-balsamic with black pepper to a Rachel’s raspberry ginger beer sorbet. Salt & Straw uses iconic local ingredients such as Westland Distillery, Beecher’s Cheese and Fran’s Chocolates in its ice cream. Our big feature on this cult ice-cream chain here. Westman’s Bagel and Coffee, from Monica Dimas and baker Molly Westman, serves New York-style bagels out of a counter window. Go early. Many bagels sell out by late afternoon. The Shambles, a butcher shop/bar in Maple Leaf, is one of the big openings this season. The bar has gone through three months’ worth of meat in the opening week and had to scramble to cure more. Check out our review here. It boasts the best beer list of any new bar or restaurant opening. Floret, a new vegetarian bar-and-restaurant from the folks behind Café Flora, opens in the Seattle-Tacoma International Airport next to the Delta Lounge. Reckless Noodles, which replaced the closed Atlantic restaurant in the Central District, serves Vietnamese-inspired cuisine. I recommend the spicy curry soup with beef cheek. It’s a sparse menu, but expect chef Kenny Lee, formerly of Lionhead, to add pho and wok-fried dishes soon. About three blocks west of Reckless Noodles sits Med Mix, which relocated to the corner of South Jackson Street and 23rd Avenue South after a fire damaged its original restaurant. Revel does a”pop-up” in the former Vestal space in South Lake Union until it can reopen in its Fremont space, currently under construction. Lunch is weekdays from 11 a.m.-2 p.m., but expect a dinner menu soon. Le Messe, from Executive Chef Brian Clevenger, opens on Eastlake, focusing on seasonal Northwest ingredients. Also expect fresh pasta along with a focus on seafood. Clevenger also runs Vendemmia, Raccolto and East Anchor Seafood. Petite Galette, a crepe counter, opens in Chophouse Row. Owner Sara Naftaly won’t need to go far. She also owns Amandine Bakeshop about 10 feet away. She and her husband, Bruce Naftaly, also run the restaurant Marmite in that building. Read about this adorable couple in our Valentine’s day story here. Rocket Taco on Whidbey Island expands to Capitol Hill in the former The Kingfish Café spot. Prices range from $9-$12 (for three tacos). Carnitas has been the most popular of the eight taco options. Like a lot of new taco spots these days, Rocket Taco makes its own tortillas. Check out our story on who makes the best tortillas in town and where to buy the best tortillas in Western Washington. Tamari Bar opens in the former World of Beer spot on Capitol Hill. From the folks behind the underrated Suika nearby, this “Japanese Tavern” offers sushi, noodles and sous-vide chicken teriyaki. R & M Dessert Bar is at the corner of East Pike Street and Belmont Avenue. It’s open until 2 a.m. on Fridays and Saturdays for your late-night sweet-tooth run. There are cakes, pastries, pound cake and banana bread. Gold Bar, a cocktail den, opens in South Lake Union. Like many spots right now, it boasts a boilermaker-menu. (You can check out our recent story on boilermakers around town here.) The bar shares space with Oro Kitchen, run by Manu Alfau of Manu’s Bodega. Lots of cheap bites under $10, from tacos to empanadas. Oro Kitchen will expand with a lunch menu soon. Next to Gold Bar/Oro Kitchen sits Evoke Coffee Co. and Café An’Clair, both serving breakfast sandwiches and pastries, targeting the Amazon workforce and other busy bees needing breakfast or lunch on the run. Voff Bark & Brew is a dog-friendly venue in the North End. Check out the play area on its Facebook. Broadview Tap House and Bottle Shop opens near the corner of North 125th and Greenwood Avenue North. Little Chengdu does handmade Chongqing Noodles and Szechuan-style street food in Rainier Valley. Congeez is now in the Uwajimaya food court in the Chinatown-International District. Its Wallingford spot is undergoing renovation but will return. Kuan Zhai Alley does Chinese food in Greenwood, featuring Sichuan dishes and takeout staples such as shrimp fried rice and General Tao’s chicken. Thai Thai Kitchen on Aurora Avenue North provides more takeout options in the North End. Pad Thai is its specialty. Café Mia opens in West Seattle with a new brunch menu with brioche and biscuits. South Park is the next hot neighborhood to keep an eye on. The strip is starting to fill up. The latest is Uncle Eddie’s, which has a full bar and sandwiches. More info here. Locus Cider, based in Woodinville, expands to Ballard with a 12-tap bar in the former spot of Kickin’ Boot. No food is served, but you can bring your own. Browne Family Vineyards Tasting Room opens in Pioneer Square next to Il Terrazzo Carmine. Evviva Woodfired Pizza opens in upper Queen Anne in the former Pizza Hut space. It’s from Luan Berisha, who opened his first Neapolitan pizza spot seven years ago in Edmonds, near the ferry dock. And speaking of Edmonds, Brian Madayag, the former executive chef for Tom Douglas’ Cantina Lena, is opening a “fast casual” spot, inspired by Filipino, Hawaiian and Japanese cuisines, called Barkada. Absinthe Brasserie in Belltown has rebranded and is now French Quarter Kitchen. King Donut is under new ownership, Eater reports. And of course, no new restaurant roundup is complete without another poke opening: Aloha Poke Co. is near the Seattle University campus. In the South End, 85 Bakery Café expands to Federal Way. The line was at least a block long for their openings in SouthCenter Mall and Lynnwood last year. But that’s nothing compared to the mayhem that surely will be unleashed when 85 Bakery opens in Bellevue, maybe later this year. The Lincoln South Food Hall opens in downtown Bellevue with a roster that’s a step up from the usual food court. Open for business: Barrio Luchador, Fat & Feathers, Baguette Epicerie, Avo Poke, Burger Brawler and Crosta E Vino. Many hawk food for around $10, which should attract the younger shoppers who can’t afford the $30 that many new high-end restaurants in Lincoln Square are charging for entrees. Gyu-Kaku, with almost 50 branches in North America, expands to Bellevue, doing Japanese yakiniku (grilled barbecue over charcoal grill). According to its Facebook post, the chain is in soft-opening mode and will take only a limited number of customers a day. If you can’t wait until it’s ready for prime time, call 425-296-8818 for one of the limited seatings. From the owner of Pho Cyclo comes Maxwella Café & Bar in Redmond, near the Microsoft campus. There’s breakfast sandwiches, and for dinner lamb burgers and seafood bouillabaisse. The Organic Coup, an organic fast-food chain, opens in Bellevue, serving wraps, sandwiches, bowls and salads in the Skyline Tower. The pop-up Local Kitchen is back after a year hiatus. Expect seven-course dinners at Caruccio’s, a food studio on Mercer Island. More info here. Chef Shinya Asami used to head the now-closed downtown Seattle restaurant Bombore. And Lunch Box Laboratory has reopened in Bellevue.